Native Americans were the first to live in Idaho more than 10,000 years ago. 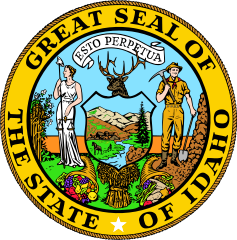 The area that is now Idaho was purchased with the Louisiana Purchase in 1803; Lewis and Clark explored it in 1805. Beginning in 1843, wagon trains headed for Oregon and Washington traveled through Idaho, and in the mid to late 1800s, Mormon settlers arrived from Utah. Northern Idaho and southern Idaho are very different places, culturally, politically, and geographically. Northern Idaho is a sparsely populated area with dense forests. The area attracts outdoor enthusiasts and tourists. Forestry is the major industry. Southern Idaho is mostly flat farmland. The area is home to many small farming communities, and wheat, barley, sugar beets, and potatoes are the major crops. Idaho is the largest producer of potatoes in the U.S. In fact, in some areas, school is closed for several weeks each fall so children can help with the potato harvest. 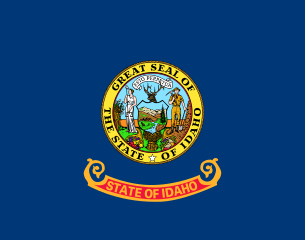 Idaho is bordered by Oregon, Washington, Nevada, Utah, Wyoming, Montana, and Canada. Craters of the Moon National Monument is covered in lava beds. The landscape is eerie and otherworldly. Question: How do Idaho farmers irrigate their crops? Answer: Southern Idaho’s climate is fairly dry. Mormon settlers built reservoirs and canals in many parts of southern Idaho. These canals are still used to bring water to crops. Watch a short video about Idaho. Declan, Tobin. " Idaho Facts for Kids ." Easy Science for Kids, Apr 2019. Web. 26 Apr 2019. < https://easyscienceforkids.com/idaho/ >.